Let’s first understand what the purpose of a paper shredder is in your office. It’s the machine that basically destroys documents that have been printed into chad. Every office needs a paper shredder. They are primarily a security requirement. If you are handling credit card information, or sensitive customer information, you need to destroy it. Remember the movie Wall Street? Charlie Sheen was getting inside information as a evening cleaning person going through people’s garbage. Sensitive information was not being disposed of properly. Security is the number one reason to have a paper shredder in your office. Strip-cut paper shredders use rotating knives (blades) to cut paper down into strips. These types of shredders are for simple use applications such as waste reduction or recycling purposes (known as animal bedding). Paper shredders that only provide a strip-cut function offer the least amount of security and privacy protection. Cross-cut paper shredders use rotating knives like the strip-cut paper shredders; however, they often use multiple blades to create a more profound randomness of shredding. Particle-cut paper shredders shred paper into small pieces (usually in circles or squares) and offer a higher level of security than standard strip or cross-cut shredders. Pierce and tear paper shredders literally rip paper or documents through a puncture and tear method of shredding. 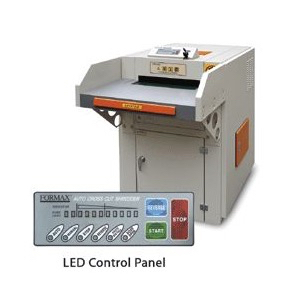 These types of paper shredders use a rotating band of special blades to accomplish proper paper shredding tasks. Disintegrators are paper shredders that continually cut paper in a random fashion until the document is destroyed enough to pass through a mesh or screen. These types of paper shredders often offer some of the highest levels of security in document destruction. If you need the top level of security for your office or print shop, you can extend protection of shredded documents a papermasher bag. This is often used to provide a secondary level of security with a paper shredder. A papermasher bag is a bag that is designed to be washed with shredded documents inside. Once a papermasher bag has gone through a rinse cycle (typically in a washing machine) the shredded documents become an illegible heap of paper pulp. Every print shop needs a shredder. You are dealing with too much confidential client information not to destroy it for both your security and theirs.